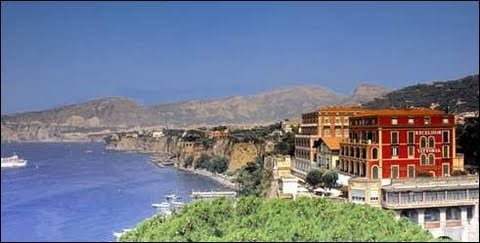 Leave it to the Romans, inventors of indoor plumbing and wine, to discover the charms of cliffside Surrentum, at the spur of South Italy’s Sorrento Peninsula. That’s where Ceasar Augustus was said to have built a villa, and that’s where, in 1834, Naples’s Fiorentino family established the Grand Hotel Excelsior Vittoria. Enter the Andreas Hotel & Spa in downtown Palm Springs, and you’ll enter three eras. First, the bamboo garden and earthenware jars will send you time-tumbling to the Native American past. That’s several millennia of mileage before you even reach the front door. Thirties Spanish Revival will hit you next. A vintage year for the town’s development, 1935 was when the hotel was built, and it’s also about when its ironwork was forged and its bricks were baked. Originally called the Royal Palms Hotel, it soon became one of downtown Palm Springs’ preferred courtyard lodgings. On closer inspection, visit one of the hotel’s 25 guest rooms and suites, and you’ll find yourself back to the future. Looking fetchingly photogenic for any architectural magazine close-up, my ground-floor suite contained sleek present tense-references like a marble bathroom and a built-in armoire amid such retro accents as wood ceiling fans, alligator-skin trunks, fireplaces and brocade-covered couches in sepia tones. The Andreas was renovated in 2004 with such modern touches as flat screen TVs, microwave ovens and oversized Jacuzzis. Its deft fusion of old and new recently got this boutique hotel nominated for a Gold Nugget Award for Architecture and Design. If you’ve ever seen It Started in Naples, you’ll remember the Isle of Capri as an exotic lair where Sophia Loren lookalikes rollick. 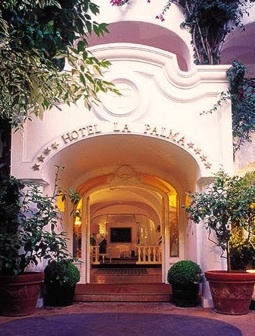 Fifty years later, beautiful revelers still steam up the Italian island’s fashionable hotels and bars, and perhaps nowhere more than in Hotel La Palma, the chicest haunt on Vittorio Emanuele II drag. Capri offers a potpourri of glitz, culture and nature, and at the close of a rigorous day shopping, eating pizza or trekking the bluffs, a glamorous spot to sip grappa and swap boasts may be just what you’re up for. Or a sauna and massage. La Palma runs the gamut. 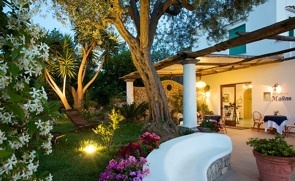 Despite its central location a Manolo Blahnik hop from the main Piazetta, Capri’s oldest hotel keeps its 74 rooms (66 double and 8 single) intimate and cozy. The frescoed walls take their cue from the airy “voyage-in-Italy” brushstrokes of 19th-century guests who painted in exchange for their lodging at the site’s original “Casa Pagano” inn. Lively Caprese scenes in equally lively Caprese greens, blues and yellows brightened the interior of my Junior Suite, where you’d half-expect a musical to break out under the faux dome ceiling and arched doorway. The striped closet curtain and majolica floor tooted the same cheery colors, as did the bathroom ceiling and wall frescos. Nearly all of the rooms have a private terrace.